It’s amazing how the screech of a poorly blown duck call can sound like a teacher drawing her nails across a blackboard. Such is the sound of waterfowl hunters who start much too late in their preparation for the season. Being prepared isn’t just about calling, either: there’s making sure your shotgun’s shooting as well as last year; checking your duck jacket to see if you need to patch some holes, or just get a new one. Is your ammo shooting the way you think it is? Every year it behooves the hunter to make sure everything is working as they want, and to find out long before it’s time to head out into the field. All too often the first chance at putting wild duck on the table turns dismal—leaky waders, missed shots—or, more dangerously so, duckboats sinking! A great waterfowl season begins months before that opener in October. Take out your waterfowl hunting clothing now. If it’s your duckhunting coat, hopefully you didn’t pack it away in a footlocker or drawer for the off-season. This compresses the insulating materials and such repeated season storage depletes their ability to keep you warm the next season. Check it for those holes, and perhaps take it to the tailor to have those shell loops replaced if they’re all stretched out. Spring is also the best time to start your calling practice. 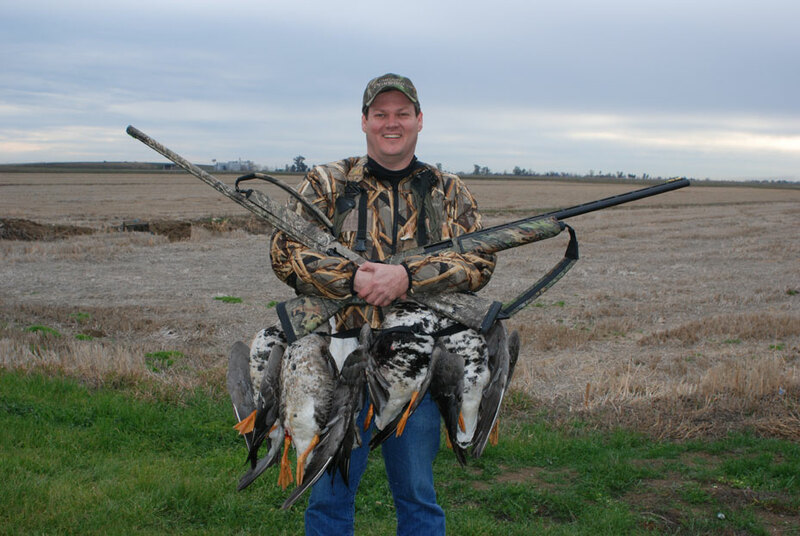 As master duck caller—and the one who taught me how to call ducks as a thirteen-year-old newbie duck hunter—Billy Gianquinto recommends, every duck hunter should purchase their calls in spring, get a good instruction tape or CD and practice everyday. It’s during this time, that I carry my duck and goose calls in my truck so that I can practice during a day’s commute. What’s nice about practicing your calling in the vehicle is that you need to have one hand free for driving, which forces you to learn how to use your call with one hand: much more appropriate for a duck hunter holding a shotgun in a blind with the non-call hand. This especially comes in handy when learning how to use a goose flute with one hand instead of the normal two. Get a good collection of duck hunting videos, not just the slicing DVDs that just show the kill shots. Get the DVDs that take you from calling to learning how to set a decoy set, to best of all, how to call based on what the ducks are doing. Gianquinto and Cajun Duck Commander Robertson Clan have some great calling instruction videos. Now’s a great time to look at what your shotgun really does and with the ammo you choose to shoot out of it. So many duck hunters just purchase a shotgun and a box of shells and head straight out into the duck blind, not even knowing how their shotgun is shooting. What sighting in at the range is to a deer hunter with a newly purchased rifle and scope, patterning a shotgun is to a duck and goose hunter. The average hunter might be surprised at how many people who purchase a new shotgun think that it need only be pointed in the general direction, and you hit what you’re shooting for. Must have been all those cartoons and mythical descriptions of how the trench guns worked in battle, especially to infantrymen whose rifle skills were wanting—but there are many that think a shotgun has magical properties. When I received my first pump shotgun I was surprised at how much I was missing. This was a shotgun built by a major manufacturer—what could be wrong? A trip to the range and aiming at a dot on a large piece of white butcher paper quickly offered an answer. The shotgun was patterning up to the right. I could have taken it to a gunsmith and had the pump modified, but instead I just remembered to adjust my shot picture while shooting. Had I not taken the shotgun to the range to find out what was really happening, I’d probably have gone on with a hit and miss for years. The decision to pattern a shotgun should be taken not when just getting a new shotgun, but also to see how a new shot load does out a specific firearm. It’s also wise to check into a new choke when purchasing a shotgun. For years I only shot the different chokes that came packaged with my shotguns and never inquired into the multitude of chokes, until last year and a chat with George Trulock, owner of Trulock Chokes and a man with a vast firearms knowledge that started in law enforcement, and distilled through many years researching the effects of chokes on shot. I learned how 3-inch chokes are a prime length for patterning a shot load especially steel shot. Unlike a rifle that is accurate because of the effect on a bullet by the rifling, a shotgun influences its shot effectiveness by forcing a load of shot into a column that will spread out in as uniform a pattern as possible. By having a choke that that forces the load in three inches instead of two, the pattern delivered is much more uniform: think shot hitting a wall, because it’s so steep and angle, as compared to sliding along the wall because the angle is lessened by the longer length of the 3-inch choke. The importance of chokes appropriate to the load was made clear a couple years ago when I tried Federal Premium’s Black Cloud ammunition for the first time. What I consider the deadliest duck medicine out there, I noticed that not only did the unique collared barrel shot perform amazingly, with solidly killed ducks, but also that the Trulock Black Cloud choke I got for hunting with the new cartridge performed admirably. One of the main reasons it works so well is that it’s designed to let out the shot and wad in a staggered manner that permits the shot to pattern effectively without creating so many flyers that destroy a pattern. 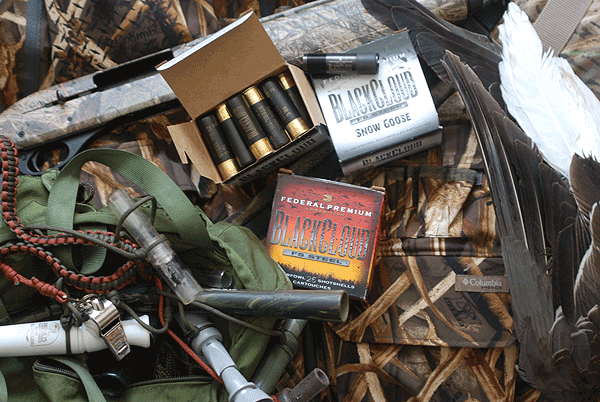 New for this year, Federal Premium has the new Black Cloud Snow Goose load. While the first release of Black Cloud was flying at 1450 fps, the new Snow Goose is screaming at 1635 fps! That means it really cuts the geese, but that also means its patterning is effected differently than the slower shot. According to Trulock, the higher the speed, the wilder the flyers as they bounce off the inside wall of the choke instead of slide along its sides. As Trulock said, it’s a tug-of-war between killing speed and uniform patterns. Too many flyers and the loss of not only the uniformity of the pattern, but also more holes in that pattern that a duck or goose can escape through. Now, all these are just guidelines. Like everyone’s personal preferences for hunting equipment, a shotgun has its own personality and by learning it’s personality, not just shooting it, but modifying it, do you make sure every shot counts…and the earlier you start preparing for the fall season, the more prepared you’ll be to make your fall waterfowl season that much more enjoyable and successful. TOPICS: Federal Premium PR Manager Tim Brandt talks about the history of Federal Ammunition’s merge with ATK, long line of excellent ammunition for big-game and waterfowl hunting, along with the new and upcoming offerings. In the coming weeks and months we’ll bring you all types of episodes on proactive conservation, whether hunting, fishing, or field management and agriculture. We’ll also release shows on cooking and field medicine and other techniques related to hunting and fishing, both on land, and in the water–yes, spearfishing and abalone diving will be included. And for you photo and video buffs who want to know how to do we what we do, we’ll even be bringing you how-tos on that too, so that you can record your own conservation efforts! Our first episode was a goose calling one that we shot at the end of the 2008-2009 California waterfowl season. We were hunting with one of the better goose callers out there: Blake Bunnell. His operation is run out of Northern California, near the Sacramento and Delevan Wildlife Refuges, and well worth a call. He can be reached at www.goosehuntingnortherncaliforniaguide.com. That episode is available for viewing here. NEW YEAR’S SNOWS. Check out the related cooking episode, too! In the next month we’ll focus on wild boar, trout and steelhead, with perhaps an abalone dive thrown in for good measure. We’ll also be sure to key you on on new equipment and technique developments so that your own experiences in the wild will be that much richer!